View Production Notes – Can see the production notes. Edit Production Notes – Can edit production notes. Export Production Notes – Can export production notes. Change Component Cost – Can edit the component cost. !CAUTION – allowing this setting overrides the cost from inventory therefore putting the GL out of balance with the inventory. Update Production Templates – User can update the templates from inside a template or by pushing from a production order. 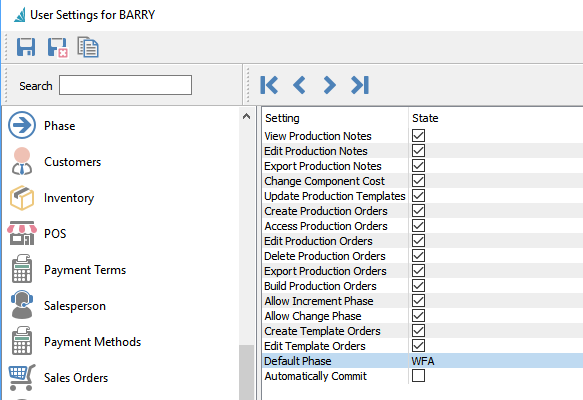 Create Production Orders – Can create production orders. Edit Production Orders – Can edit production orders. Delete Production Orders – Can delete production orders. Export Production Orders – Can export production orders. Build Production Orders – Can build production orders which add the produced item to inventory and relieves raw material. Allow Increment Phases – Can increment to the next phase by clicking the button in the production order or on the production order list. Allow Phase Change – Can edit the phase. Create Template Orders – Allow to create templates. Default Phase – What phase a production order is set to when adding a new order. Automatically Commit – When setting a production order to ‘Pending’ or ‘In Progress’ it commits the complete order instead of the user committing line by line.